Can I Polyjack In The Winter? We won’t lie, the winter is usually a slow time for us. People get busy with family activities, dealing with the weather, and frankly, just hibernating. In addition, people may not know that they can polyjack their concrete during the winter months. We understand, there are a lot of winter days where outdoor activities are the furthest from our minds. There are several reasons why you may want or need to have your concrete leveled. 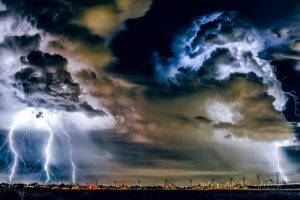 If the problem is dangerous or damaging your house or business, or you’re looking to sell the property, you may not be able to wait until the weather warms up. The reasons may override your schedule. Is It Too Cold to Polyjack? 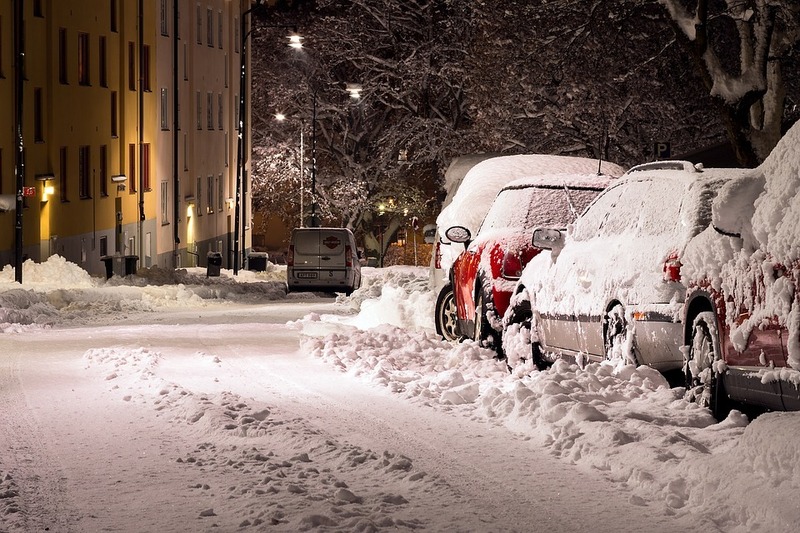 The temperature does factor into the success of your concrete lifting, but you may be surprised by other factors that come into play during the winter. Extreme cold can cause the ground to freeze solid making the concrete lifting difficult or downright impossible. The frozen earth can hold onto the concrete, sticking to the bottom of the slab and possibly causing the cement to break before it can even be raised. It is almost impossible to perform mudjacking during the winter. The mud slurry that is used to raise the concrete can freeze inside the pump or hoses, making it impossible to move the slurry. Water is used to remove excess slurry, which isn’t an option in below freezing conditions. Due to the mess and danger of mudjacking, most projects are done outside, so the winter prevents that from being a common option for concrete lifting during that time. Polyjacking can be limited by extremely cold temperatures, however, the limits are much less than those that impact mudjacking. The polyurethane foam that is used for polyjacking is created by combining two liquids. These liquids are heated in a temperature controlled environment, then injected through a heated hose. The foam is largely unaffected by outdoor temperatures, so it can be used effectively in cold weather. If you are in need of concrete lifting and aren’t sure if it’s too cold out, just give us a call and ask! As you know, the weather could be below zero one day, then in the 50s the next. We’ll be able to let you know when we’ll be able to safely lift your concrete. We don’t want to cause more problems than you already have, so we’ll be upfront and honest with you in regards to the best time for your particular project. Contact us today to learn more about polyjacking your concrete any time of the year. We look forward to providing you with a safe and strong concrete surface. Concrete surfaces such as basement floors, driveways, patios, and more are all impacted by soil movement and weather that can cause damage and weakness. The slabs can also sink if the surrounding soil no longer supports it. These problems won’t repair themselves, the longer you wait to fix the problem, the bigger the issue and damage will be. If your foundation sinks, it can cause damage throughout your business or home. Walls and floors can crack or lean, floors can slope or warp, and doors and windows may not stay open or closed. The worst case scenario is that the foundation collapses and brings your structure down with it. If the soil that supports the foundation or concrete becomes oversaturated, too dry, or isn’t compressed correctly, it will no longer give the slab the stability that it needs. Luckily, there are solutions to keep your concrete and foundation stable and level. Sinking concrete usually occurs because a void has formed under the slab. Unless the void is filled and the soil stabilized, the concrete will continue to sink. If left unaddressed, the repair may have to be done with underpinning, greatly raising the time, money, and effort needed to fix the problem. When it comes to the task of filling in voids, mudjacking and polyjacking both are up for the job. Mudjacking uses a mud slurry to fill the void and lift the concrete, whereas polyjacking utilizes a polyurethane foam to fill the void. In both methods, holes are drilled into the concrete above the void and then the slurry or foam is injected, filling the cavities below the concrete. The slab will be lifted to a level plane and the drilled holes will be filled. Mudjacking uses bigger holes than polyjacking (3-4″ compared to 3/4 to 1″). Both forms of concrete lifting can be used for a variety of concrete surfaces including foundations, sidewalks, warehouse floors, tennis courts, and swimming pools. Though both methods are similar at face value, there are some pretty big differences between mudjacking and polyjacking. We want to offer the best repair methods to our clients. We have been using polyjacking for so long that we coined the name! In the past, only commercial properties and municipal projects used polyjacking, but we have learned over the years that it is a great solution for residential repairs, too. We’re dedicated to providing the residential and commercial owners an affordable and lasting repair for sinking and damaged concrete slabs and foundations. We know that you don’t have the time to have your place torn up with heavy equipment and then having to wait for the slab to be ready to be used. Polyjacking uses only one truck for the foam and the slab is ready to use within 15 minutes of completing the injection. We won’t tear up your landscaping or disrupt your business while getting your slab repaired. You can rest easy knowing that your concrete will be stable when it comes to sinking, heaving, or cracking. 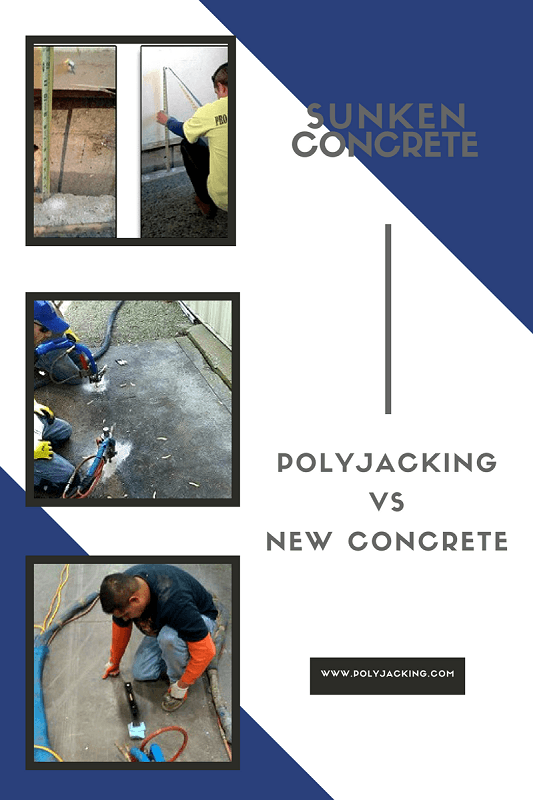 Contact the concrete lifting experts at Polyjacking.com to learn more about how our polyurethane foam can lift your concrete and provide you with a stable and strong surface, protecting your property, equipment, and people. Most of the service area covered by Polyjacking.com has had a lot more rain this summer than usual. In addition to ruining a lot of outdoor plans, the rainfall may have wreaked havoc with the foundation of your home or business. If your building wasn’t flooded, why should you be worried about the amount of rain in your area? When there is a lot of rain, it has to go somewhere. Some of it may run into storm sewers or creeks or other planned run-off areas. Most of the time, though, it goes into the soil until the ground is saturated. The water-soaked soil can cause problems for concrete slabs and foundations. When the soil is oversaturated, it can exert a tremendous amount of pressure on its surroundings. This is called hydrostatic pressure and it can damage a foundation wall completely. If the foundation of your building is under the strain of hydrostatic pressure, the walls may begin to bow or lean. Walls and slab floors may show cracking as the soil and water pushes against the rigid concrete. Water will take the path of least resistance and can erode the soil around it. When the soil gets washed away, it removes the support from around the foundation or slab. Voids can open underneath the concrete, allowing the slab to sink or crack. If the rain falls too fast or the ground is saturated, the water can flood buildings or enter cracks no bigger than a hair. Water can weaken concrete and put your slab or building in danger. There are steps you can take to help keep your home or business dry. You can make sure that your gutters and downspouts are clear and emptying at least 10 feet from the foundation. 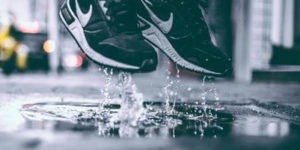 In addition, companies like Pro Foundation Technology, Inc. can provide you with waterproofing techniques to keep the water out of your building. Some options that can help with surface drainage include drywells, gutters, and French drains. It is important that you have good surface drainage or the water you keep out of your building will just come right back, trying to enter your foundation. To properly install exterior drainage, the outside of the building will have to be excavated, exposing the footing. Most reputable contractors will roll on or spray a polymer waterproofing product. A drain pipe system should be installed for continuous drainage. The drain can empty to a sump pump system or to daylight. One of the most important parts of a waterproofing system is the implementation of a sealed interior drain tile system. Since the system is underneath the foundation, it is important that it is installed correctly from the start. Cracks in the walls and floor will need to be sealed with epoxy or polyurethane. A sump pump system can move water out of the building, keeping water from flooding the structure. The system consists of a sump pump, a sump pit, and we recommend a battery back-up sump pump. My Slab is Damaged, Now What? So after all of the rain this summer you may be facing a damaged concrete slab or foundation, so what can you do? Before you call in someone to have the slab torn up, contact the experts at Polyjacking.com. We will come out and look at your property and determine if polyjacking is the solution you need. Polyjacking a slab is a LOT cheaper than destroying it and replacing the concrete. The process is relatively easy and doesn’t require heavy machinery. Small holes are drilled in the concrete and a polyurethane foam is injected under the slab. The foam expands, lifting the concrete and filling in any voids and cracks underneath the slab. The foam is water-resistant, so it won’t erode and the foam compacts the soil, making it more stable. 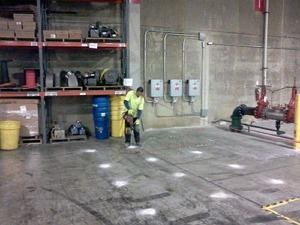 By the time the equipment is removed and the area is cleaned up, you can use the slab. Curing time is about 15 minutes, so you won’t have to wait long to get back to business. Contact the pros at Polyjacking.com to learn more about how using polyurethane foam to repair your concrete is the most cost-effective and long-lasting solution available. 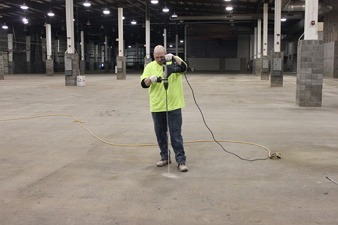 With all of the activity that takes place in warehouses, manufacturing plants, and other industrial buildings, it is easy to let the concrete floor to become damaged or worn out. There always seems to be something else that needs to be repaired or replaced, but if you let your commercial concrete floor problems grow, the time and money it will take to repair them will just get larger and larger. There are some things that you can look for to decide if you need repairs done on the floor of your industrial facility. Floor Cracks: Every concrete floor will develop cracks over the years and, in many cases, the cracks are harmless. There are some cracks that are structural in nature and those are the kinds that you need to pay attention to. How can you tell if a crack in your concrete floor is cosmetic or structural? If the crack is wider than the thickness of a credit card or runs the length of the floor, there may be cause for concern. Also, if the crack is between two levels of the surface or the slab is tilted, you may have a concrete problem. There are some causes for these kinds of cracks. Either the slab has settled unevenly, or there is a void underneath the concrete. Regardless of the reason, it is important that you have a trusted professional repair contractor inspect the concrete slab. If the damage is caught early enough, a process like polyjacking or other slab lifting method could be used successfully. The concrete slab can be stabilized and the cracks filled, leaving you with a floor that is like new, preventing further damage from occurring. Slab Deterioration: Because the slab is located inside a commercial facility, it is more likely to be subjected to heavy wear and tear. Forklifts and other machinery can wear off the top layer of the slab which is usually the hardest portion of the concrete. The softer part of the concrete will deteriorate quicker, causing more problems for the slab and for your employees to do their jobs. It is important that the damage is stopped before it can become dangerous. The surface can be ground to a smooth surface and a penetrating sealer can be applied to harden the concrete. This new surface will allow your equipment to run along the surface safely. Damaged Joints: If the joints in your slab were not filled with a flexible joint sealer, they will begin to chip and fail. The chips can begin to get big enough to jostle the forklift, the operator, and the load that they are carrying. This can cause injuries to the operator and other people around and also can damage products and equipment. An experienced contractor should inspect the joints and determine the next course of action. This may involve rebuilding the joints and lifting the slabs to evenly match each other. There are several methods of repairing a commercial concrete slab, but you will probably need something that won’t interfere too much with the daily operation of your facility. Some people think that you have to completely tear up the slab and start from scratch. Although this may be the best solution in some cases, many times you only need to lift the slab. If you are looking for the most efficient, cost-effective, and environmentally sound method of slab repair, we strongly suggest using polyjacking. Polyurethane concrete lifting has been used extensively for over 30 years in all types of heavy-duty, real-world conditions and locations. The polyurethane foam can lift the slab to within a tenth of an inch of the desired height and will remain there. The structural integrity of the slab is maintained, through the use of smaller holes than a process like mudjacking would use. The foam will seal the underside of the slab and fill in any voids located under the concrete. The foam is water-resistant, so it won’t wash away from erosion like the mud slurry in mudjacking. You will be able to use the slab about 15 minutes after the foam is injected, unlike other methods that may take multiple days to set. 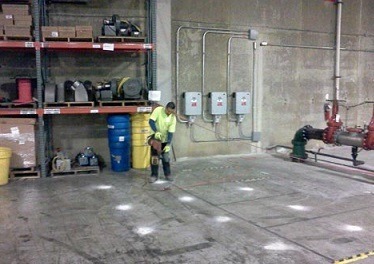 By the time we have cleaned up and put the equipment away, you’ll be able to drive your equipment on the repaired slab. If you are looking for a reputable and reliable polyjacking contractor in Kansas or Missouri, contact the professionals at Polyjacking.com. We have experience leveling and undersealing concrete of all types: bridges, highways, runways, sidewalks, garage floors, warehouse floors, loading docks, and more. Get in touch with us for a free quote and we’ll make sure that your industrial concrete floor is safe, stable, and secure. The St. Louis area has had its share of extreme weather this winter. The extremely cold weather has caused pipes and water mains to freeze break causing water-related problems around the area. According to television station KMOV, Missouri American Water is likely to break the current record for most water main breaks in one month, with a prediction of over a thousand breaks total. In addition to losing water to your St. Louis home or business, a broken water main or pipe can cause problems for your concrete. The already frozen ground will be flooded with gallons of water with nowhere to go. The pressure will lift your concrete slabs, cracking them or causing a tripping hazard. Freezing water expands, so if the water from the broken main infiltrates a crack in your concrete, it can easily cause the crack to grow. The good thing about a St. Louis winter is that it will get warm again, so even if the water is frozen now, it will eventually thaw out. However, when that happens, the soil will be oversaturated and lose some of its stability. Your concrete surfaces may sink or crack as voids open underneath the slab months after the winter is over. If you notice any signs of concrete damage, contact an expert like the ones at Polyjacking.com. It is urgent that you begin concrete repairs as soon as possible. The longer you put off a repair, the more it will take to correct the problem and the more money it will cost. The slab won’t heal itself and, in the long run, the concrete will eventually fail, taking your driveway or patio with it. It is important to protect your property and your family or employees. You should make sure that you have the best concrete expert in the St. Louis area. If you have cracks in your concrete or the slab is sinking or unlevel, it is important that you get it repaired before someone gets hurt or other problems begin to occur. We recommend using high-density polyurethane foam. This foam is injected under the slab and, as it expands, it fills the voids, seals the cracks, and lifts the concrete to the desired height. Polyjacking a slab is 75% less expensive than breaking up and replacing the damaged concrete. We know that St. Louis businesses and homeowners don’t have time to wait to use their sidewalks or driveways, that’s why polyjacking is such a smart choice. 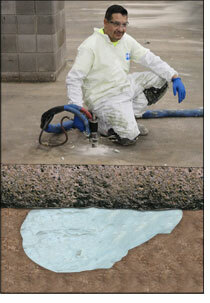 It takes 80% less time to complete the repair and the slab can be used within 15 minutes of the foam being injected. Due to this quick turnaround time, traffic and pedestrians can quickly use the slab once again, safely. The soil in the St. Louis area is mostly expansive clay, so it is constantly moving. The polyurethane foam expands, filling the void, which minimizes the chances of the soil failing again. The foam also seals off the bottom of the slab, eliminating the water from penetrating the concrete or eroding the slab. Polyjacking.com is dedicated to providing the best service in the St. Louis area. We are a family-owned business and we know that quality workmanship is the only way to earn a good reputation. Contact us today to learn more about how polyjacking can help protect your property in the St. Louis area. How Do Voids Under Concrete Form? Settlement is a natural occurrence that happens over time. It can occur with new construction or with a property that is a hundred years old. It all depends on the type of soil and the weather patterns. Heavy rains or flooding can cause the soil to settle faster than normal. If the settling soil is in a large enough area, it can allow erosion to occur. Settling soil sets the table for a problem, erosion just makes it worse. If water doesn’t drain correctly or there is new landscaping or other additions to the property, erosion can start after years with no problems. The water will run freely, washing out the soil and creating a void under the concrete. The bigger the void, the more damage that can occur. You don’t have to tear up your concrete to fix the problem of having a void. The best solution is polyjacking. A high-density polyurethane foam is injected through small holes into the voids. The foam expands, filling the void and sealing any cracks on the underside of the slab. The foam will not wash away and the slab is usable shortly after the foam is injected. Mudjacking is an alternative, but the sand-based grout can be washed away or not completely fill the void and you’re back to square one. You’ll still need to take care of drainage problems, as they will continue to cause problems for your home or business. Make sure that water is draining correctly and away from the foundation or concrete area. The polyurethane foam won’t wash away, but the surrounding soil can erode. Let a company like Pro Foundation Technology assist you with waterproofing services. Protect your property from foundation damage, trip and fall hazards, and sunken concrete by making sure the water is draining from your property. If you already have problems, let an expert like those at Polyjacking.com help you restore your concrete slab to the necessary height. Ice and cracks are not a good combination. If you have cracks in your concrete, they can let water in and if that water freezes, the crack will grow bigger. As we all know, a Kansas City winter can be a nightmare! When water turns to ice, it can expand almost 10% more in volume than its liquid amount. This is a small number in the big scheme of things, but even a small change in a crack can cause a big problem. The pressure behind expanding ice is very strong. According to chemical engineer Geoffrey Widdison, freezing water can theoretically exert around 30,000 psi! That amount of force can easily destroy concrete foundations and slabs. The cracks can spread and grow wider, causing a wide variety of structural problems. The problems can happen when your property experiences its first freeze-thaw cycle, getting worse with every cycle. As stated earlier, this can impact both foundations or concrete slabs. Once water enters the crack, your home or business could have water in the basement or crawl space or it could enter the foundation walls. Water can also cause concrete shrinkage and other structural damage. As much as some of us would like to stop winter from coming, it comes just the same. The winter weather in Kansas City can damage your concrete slab, foundation walls, and any other concrete surface you may have at your home or business. The surface of the concrete can be a victim of “mortar flaking“. This occurs when the top layer of the concrete peels or flakes off. As we stated above, any previous cracks can get bigger and longer and new cracks may form. Cracked concrete loses a lot of its strength and can lead to foundation failure or trip hazards on concrete slabs. Yet another problem is something called “popout”. 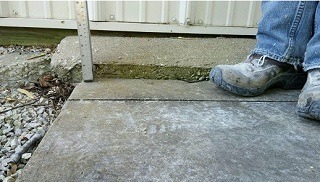 Popout occurs when the water behind or underneath a concrete surface swells, pushing against the concrete. It can cause flaking, crumbling, and cracking. This can occur at any time of the year, but it is more prevalent in the winter months. The best thing you can do to protect your concrete is to keep water from freezing on it or next to it, but that’s pretty difficult. 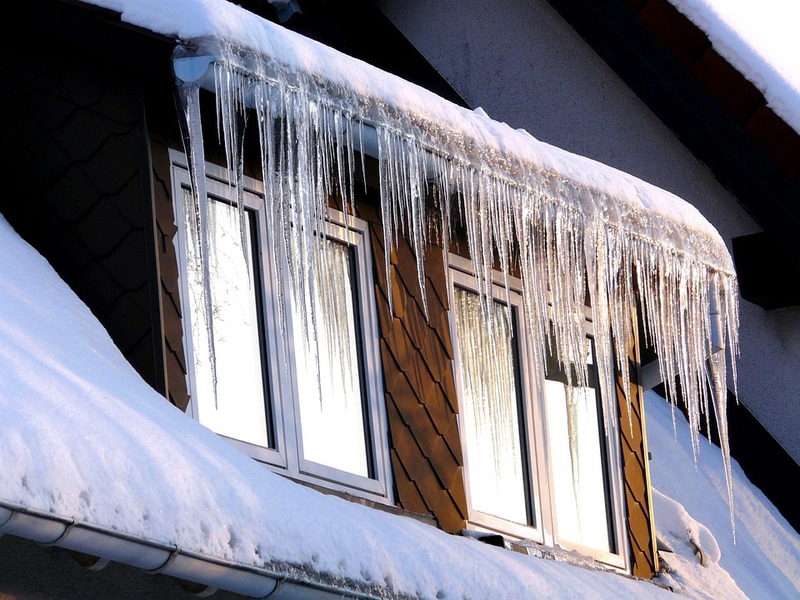 Make sure that your home or business is ready for the winter weather. Downspouts and gutters should be clear and drain well away from the foundation, at least 10 feet or more. Clear snow and ice from around the foundation; melting snow can run down the foundation walls and cause problems. Polyjacking.com can help you keep your concrete stable and safe. With Pro Foundation Technology behind us, we can offer waterproofing, concrete lifting, and more. We’ll keep your home or business safe, dry, and comfortable. Get your Kansas City property ready before the winter really gets nasty, so you won’t have to worry about problems with your concrete and foundation. 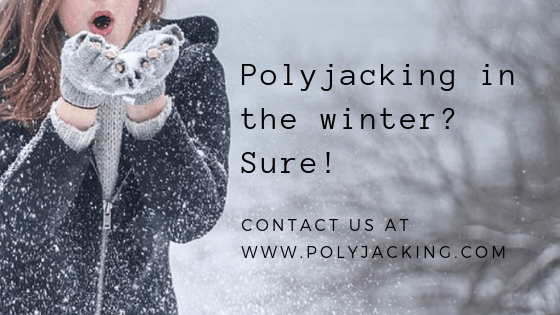 Contact Polyjacking.com now and let us help you get ready for a visit from Old Man Winter! Trip and fall accidents are the #1 leading cause of injuries around the home, but should you replace your slab or have it lifted? Protecting your family, employees, and customers are all important, but you need to make an educated decision. In the past, most people would just break up the old slab, level out the underlying soil and have new concrete poured in the same location. Today, polyjacking has become a much better option and has become more popular throughout the industry. The polyjacking process is relatively simple and, though it doesn’t take long, it is extremely effective. The process uses little equipment, so you won’t have a bunch of trucks or other machines cluttering up your property. Small holes (5/8″) are drilled into the slab. The polyurethane foam is injected through the holes and expands under the slab, filling in voids, gaps, and cracks. The slab is raised to the required height and the foam seals the bottom of the slab, preventing more gaps and cracks from forming. Once the slab is raised to the desired height, the holes are closed and the foam cures in about 15 minutes. Once the foam is hard, you can walk or drive on the slab, allowing everyone to get back to their normal day-to-day routine. We’ve told you about the process of polyjacking and some of the benefits, but what about replacing the slab with new concrete? With polyjacking, there is little disturbance to your lawn and landscaping, whereas heavy equipment is needed to break up the old concrete and remove it. After the slab is removed, a mixer is brought in to pour the new slab, adding to the machinery required. Polyjacking just uses one truck or trailer to raise the slab. If you are debating whether to go with polyjacking or pouring a new slab, contact Polyjacking.com to go over your options. We’ll be honest with you and show you the pros and cons of each method. Is Water Ponding on Your Drive or Patio? If there is no obvious crack or hole in the concrete which allows water to seep onto its surface, water ponding often is caused by incorrect grading of the concrete slab from the time it was poured. It is critical that the concrete is set up with a slight slope away from the house and foundation so that the water has an opportunity to run off into the yard, drain, or drainage ditch. If not, water will simply remain pooled on top of the concrete. Frequently, natural settlement of the soil through the passage of time will cause the concrete to sink in such a way that water is unable to run off. For that reason, builders often recommend not building concrete patios until the soil around a new construction has had adequate time to settle. Most often, water ponding is due to changes in the soil beneath the concrete slab. After cycles of wet and dry or freezing and thawing, the soil beneath the concrete may become unstable and develop pockets or holes. Eventually, the soil will not be able to support the concrete, and the concrete will actually sink into the holes beneath it. Naturally, after a heavy rain, water will pool into the lowest sections of the concrete. There are basically three choices regarding what to do to repair a concrete slab that has water ponding. You can grind it, replace it, or raise it. The following information explains the three options along with their advantages and disadvantages. Hopefully, it will help you determine the best option for your sinking concrete. Grinding involves milling off a portion of the good concrete slab so it matches the sunken slab. While it may eliminate a trip hazard, it does not solve the underlying problem and offers only a short-term solution. While some companies are willing to grind off a layer of a good slab to fix a trip hazard, it doesn’t solve the underlying problem: what caused the slab to settle in the first place? Unfortunately, whatever caused the problem in the first place will simply return, usually within a year. If the company grinds the concrete a year later, the problem will simply occur the next year, and so on. The bottom line is that grinding a good section of concrete never solves the root of the settling problem. It’s the underlying soil that caused the settling in the first place. After several years have gone by, the concrete will simply become too thin and crack, requiring the entire slab to be replaced. Besides paying for the annual grinding, the homeowner is now faced with the expensive option of replacing the concrete. If you are extremely tight on funds, grinding could be a solution for you. Keep in mind that it is a short-term fix that eventually will require replacement of 2 or more concrete slabs. Replacement involves tearing out the old concrete and building a new concrete slab in the same spot. It is very costly and disruptive and could lead to further problems in other parts of the structure. Replacing a concrete slab is the most expensive method to eliminate a tripping hazard. Not only will you have the cost to tear out and remove the old concrete, but you will also need to pay for the grading, materials, and labor for the new slab. Concrete replacement is also extremely disruptive. Besides creating loud noises with the jack-hammers, removing the old concrete creates a great deal of dust and mess. It also tears up the soil and landscaping surrounding the slab. Bringing in a cement truck to pour the concrete can also tear up the yard and make a mess. Also, it takes a long time for the concrete to cure before you can use it again. Finally, concrete removal and replacement could damage other parts of the structure while the concrete slab is removed and the soil is disrupted. If they are not properly braced, adjacent decks, porches, crawl spaces, drainage systems, and the foundation itself could be damaged during the process, leading to an even greater expense. Concrete raising involves pumping either a concrete grout (mudjacking) or a polyurethane solution (polyjacking) through holes in the concrete slab to fill the voids underneath and raise the concrete. Mudjacking lifts and raises concrete slabs by pumping sand-based grout beneath it. The force of the pump pushes the slab back into place. Unfortunately, it is very messy, takes a long time to dry, and isn’t a permanent solution because the conditions that caused the soil to shift under the slab still exist. It will only be a matter of time before the slab has slipped again. Polyjacking, sometimes called foamjacking, lifts and levels slab foundations through injecting a high-density polyurethane foam beneath the slab through small holes drilled in the concrete. The foam expands and gently lifts the entire slab back into place. Poly foams can be customized to each type of soil and conditions. Initially, polyjacking is more expensive than either grinding or mudjacking. In the long-run, however, it is more cost-effective because it is extremely long-lasting and will not need to be redone in a year or two. Also, polyjacking not only stabilizes the soil, but it also strengthens it, so that the concrete is far less likely to crack or need to be replaced. Polyjacking.com can raise your sunken slab to its proper level within an hour, allow you to use the slab almost immediately without waiting for concrete to cure, and provide a long-term solution to your problem. Contact us today for a free estimate! Polyjacking.com, a division of Pro Foundation Technology, specializes in lifting and leveling concrete foundations and slabs. One common technique in foundation repair is to utilize piers to lift and stabilize a damaged foundation. Because we want the repair to be permanent, we use only the highest-quality foundation piers in the industry, those manufactured by Earth Contact Products (ECP). ECP is the undisputed highest-quality manufacturer of foundation repair and related products in the United States. In addition, their products are offered at competitive prices and have a 25-year warranty. Earth Contact Products (ECP), founded in 1998 in Olathe, Kansas, has a very simple mission – “To be the very best manufacturer in our industry by providing quality products and services in a timely manner at a competitive price.” Following are some of the reasons why ECP products are considered the best foundation repair products in the industry. All ECP products are “Made in the USA” with American materials and labor. Some companies use materials and products manufactured internationally in order to cut costs. ECP has often found that cutting costs means compromising quality. All of ECP’s products are manufactured right here in Kansas because they have found it’s the best way to assure they use the highest quality materials and labor in their manufactured products. ECP maintains a close relationship with its foundation repair customers in order to understand their needs and ways to improve their products. The ECP Engineering Department is constantly working to provide innovation in its products and how they are manufactured. ECP has been awarded patents and trademarks on more than 18 items. ECP maintains a large inventory of foundation repair products to meet the requirements of each project and guarantees fast delivery. If a special part is required, they also manufacture custom-made products upon request. ECP understands that Polyjacking.com and their other professional foundation repair customers rely upon their products and services in order to provide end customers high-quality and long-lasting repairs. They have a reputation for providing equipment in a timely manner and being responsive to unique situations. ECP stands firmly behind the quality of their products, and they all have a 25-year warranty against defects. ECP is one of the largest manufacturers of piers for foundation repairs. They produce basically two types of piers: steel push piers and helical piers. Both kinds of piers are driven into the ground and anchored to your structure in order to lift and stabilize the building. Because both the products and installation are the highest quality, this type of repair is permanent, you won’t need to call us back in a year to redo the work on your home’s foundation. Push piers are hydraulically driven through ECP’s patented steel brackets until they reach load-bearing rocks or soil. They have an unlimited structure lifting capability that can be installed with portable equipment so that we won’t need to bring in heavy machinery or destroy your lawn and landscaping. Polyjacking.com can install these push piers any time of year so that we have the ability to respond quickly as soon as you need to do the repair. Another advantage of push piers is that they can be installed from either the inside or outside the structure, depending on the circumstances. Like push piers, ECP’s helical piers are hydraulically installed and anchored to a steel bracket. Unlike push piers, helical piers are screwed into the ground while the plates pull the support rod into the ground. Before work is begun, installers will predetermine the torque required to support the weight of the structure. Helical piers are ideal for lighter weight applications, such as decks and porches. They are also very quick and easy to install. ECP’s complete line of products offers optimal solutions for residential, commercial, or industrial deep foundation problems. They have over 95,000 square feet in their manufacturing facility, including robotic welding, computer numerical control (CNC) capabilities, and certified welders. They have the capability to create custom-made products for specific foundation repairs. ECP maintains a national network of foundation repair contractors with the knowledge, training, and experience to do foundation underpinning according to your local building codes. Customers can call from anywhere in the country and be referred to a local ECP foundation repair professional. When you contact Polyjacking.com for foundation lifting and leveling, you can count on the fact that we use only the finest ECP products for your foundation repairs. For further information, contact us today for a free estimate!